A legal team from the Chambers of the Attorney General is actively reviewing the agreement between the Government of Guyana and Hong Kong Golden Telecom Limited (HKGT) with regard to monies owed for the purchase of shares in the Guyana Telephone and Telegraph (GT&T) Company. Back in 2010, the Government of Guyana under the stewardship of then- President Bharrat Jagdeo sold its 20 percent shares in GT&T to Hong Kong Golden Telecom Limited (HKGT). The China-based company purchased the shares from HKGT through National Industrial and Commercial Investments Limited (NICIL), the State –holding company. However, Hong Kong Golden Telecom Limited paid only a portion of the money for the shares. The Chinese company was supposed to pay some US$30M for the shares in GT&T. The company is said to have handed over only US$25M. However, with contention surrounding the remaining US$5M owed by HKGT, last year the State announced it will be heading to an international court to recover the outstanding monies. 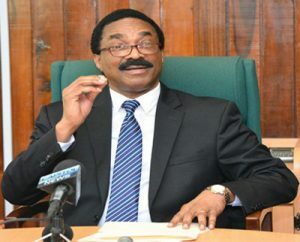 During a press conference held at the Ministry of Legal Affairs yesterday, Attorney General and Legal Affairs Minister, Basil Williams, explained the agreement is currently under examination by the legal team. We are currently looking at the agreements and our options to suitably advise Cabinet. But what I can tell you based on what I’ve seen to date is that we are more inclined to Arbitration,” Williams told the press. Earlier this year, the government announced that NICIL is again looking to head to the courts in the United Kingdom (UK) in an effort to recover the US$5M owed to Guyana. Minister of State, Joseph Harmon had said that NICIL rejected an offer from Hong Kong Golden Telecom Limited in relation to the outstanding US$5M. The offer is apparently way below what is owed to Guyana. As a result, NICIL has decided to head to the court. Government’s 20 percent shares in GTT were sold to the Chinese firm in 2012. In March 2016, Harmon and a delegation travelled to China to engage in discussions regarding the outstanding money. Harmon had reportedly obtained documents, which showed that the money was paid over prior to the APNU+AFC Coalition taking office and efforts were underway to track the money. However, NICIL subsequently said that it had not received the outstanding balance. The government later clarified that no such documents were received. This is not the first time NICIL has decided to head to court over monies owed to the Government.